Harry Christophers and the Handel and Haydn Society chorus at King’s Chapel on Saturday night. The sanctuary at King’s Chapel, close to modern-day Downtown Crossing, was awash in soft electric light on Saturday night, its stark lines and curves gently illuminated. Would it have been so different on Christmas evening in 1815, when the Handel and Haydn Society announced to the world its arrival in that very space? Certainly one imagines more smoke and heat — civic electricity was still almost 70 years away — and choristers whose candles were not battery-operated. On that night, the society — conceived in March of that year, and constituted in April — proclaimed a course that remains largely intact at its bicentennial. 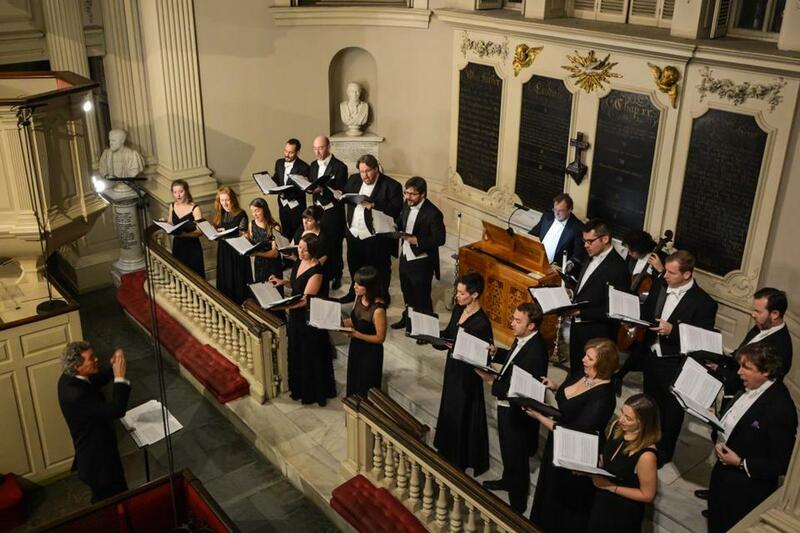 It performed music by its two namesake composers: selections from Handel’s “Messiah” to declare allegiance to past masters, and from Haydn’s “Creation” to proclaim equal interest in the work of contemporary creators. One number apiece from those same oratorios concluded the hourlong celebratory event that Harry Christophers directed on Saturday: “The Heavens are telling,” from “The Creation,” and, inevitably, Handel’s “Hallelujah” from “Messiah.” Among the six pieces that preceded those climactic offerings, four came from “The Old Colony Collection,” an 1823 hymnal that the society helped to publish — and in so doing, serving to shape tastes in American sacred music. Yet for all the historicity, Saturday’s concert also showed some measure of the society’s change since it was founded. Our present notions of what constitutes proper presentation of Baroque and Classical works are not those of our forefathers. Instead of a 100-strong chorus — 90 men and 10 women — Christophers led an elite complement of 26, women outnumbering men by a pair. In place of the 13 instrumentalists mustered in 1815, two keen players sufficed: the organist Ian Watson and the cellist Guy Fishman. The “Colony Collection” numbers fascinated. Concise, dramatic anthems by composers prominent in 18th-century ecclesiastical circles — “Hear my prayer, O God” by James Kent and “Bow down Thine ear, O Lord” by Thomas Linley — framed offbeat borrowings (a gently swaying Russian air; Mozart’s noble “O Isis und Osiris”) outfitted with pious verse. Understandably, nostalgia and festive display could affect execution. A passage here or there was rendered less pristinely than it might have been in a conventional concert setting. Splitting the singers between the church’s chancel and its organ loft, with Christophers conducting in the aisle, inevitably impacted balance and coordination. So what? Celebrations typically warrant small indulgences. And here, ample pleasures — elegantly blended choral singing; sumptuous isolated contributions from Margot Rood, Emily Marvosh, and Sonja DuToit Tengblad; Watson’s bubbly work on a Henk Klop replica continuo organ, and grander strokes on the chapel’s 1964 C.B. Fisk instrument (Op. 44) — compensated resoundingly.